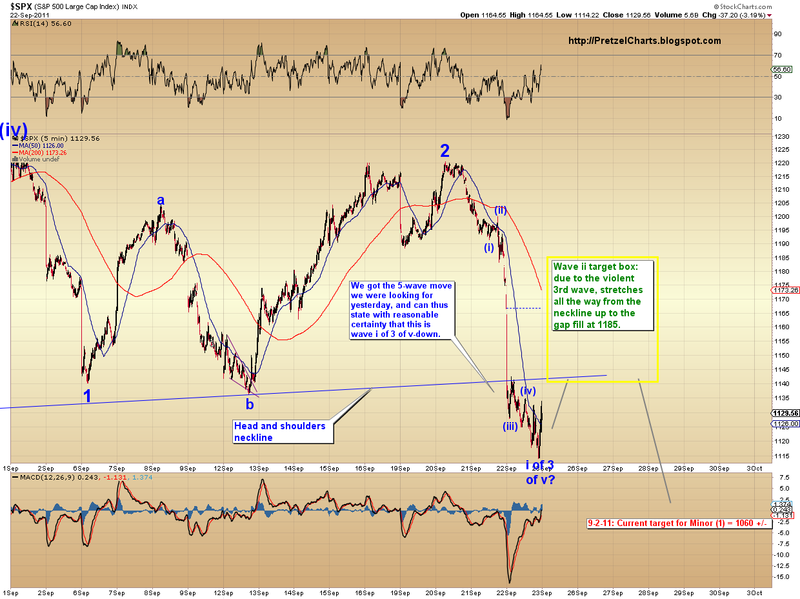 The market continues to vindicate our views, and probably owes us a cookie. We're happy to keep on being right... until we're wrong, anyway. ;) Bound to happen sooner or later. For tonight's post, we're going to put on our edumacationalistic capz, and help folks understand some of the basics of Elliott Wave Theory, as well as exactly where we believe this market is positioned in relation. So, before I get into the charts too much: As a refresher, our preferred view has been that we are beginning wave C-down of what will likely become the most devastating bear market of our generation. It is our view that we are currently in Minor (1) down of what will become a larger five-wave impulse move down (for those not well-versed: please familiarize yourself with "The Big Picture" long-term count and chart, link posted to the right). Within that Minor (1), we believe we have completed i-down, ii-up, iii-down, iv-up, and are now in the process of forming v-down. 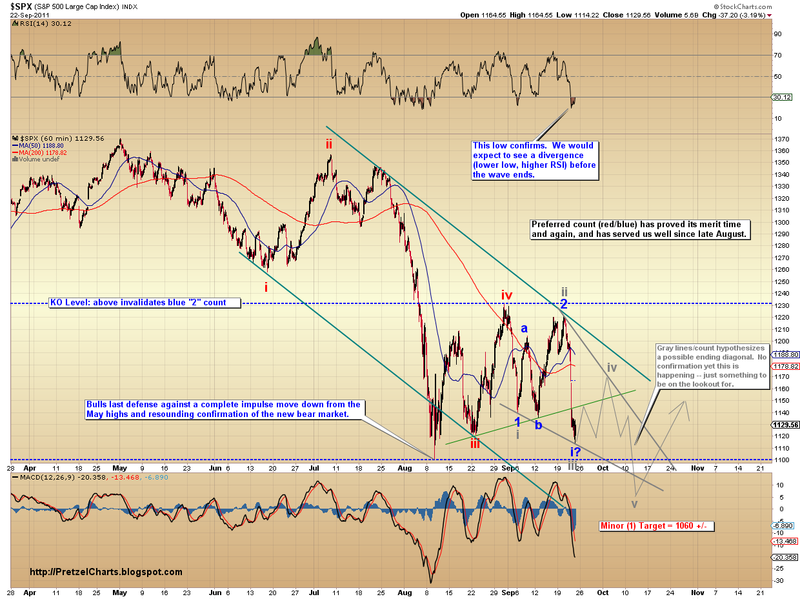 Wave v-down cannot be fully confirmed until the 1101 low is breached. 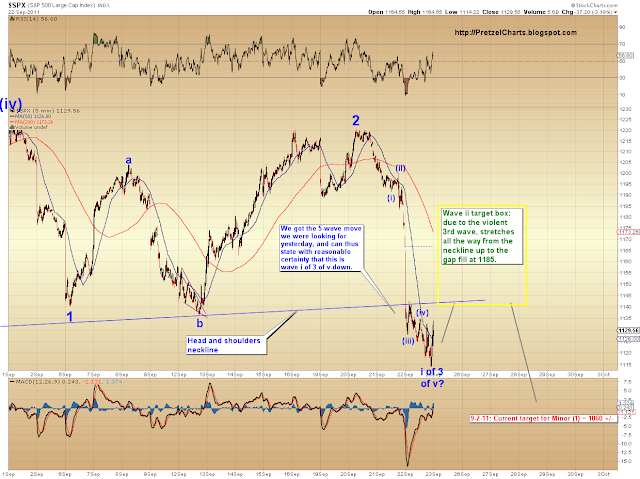 However, it is our belief that this will happen soon, likely after a brief snap-back rally. Assuming our analysis of the charts has been accurate, and we are in wave v of minor (1), then the question becomes, what form is wave v likely to take? The first is that wave v-down will take the form of a traditional "stair-step" impulse down, as follows: wave 1 (see chart below) started the move; wave 2 snapped back to correct a portion of that; wave 3 moves the market lower than wave 1 did (note, the view is this is only part of wave 3 so far), and is generally longer and faster (wave 3 is typically the strongest wave; psychologically, 3rd waves are the moment of "recognition" for the masses, when they realize things are either going better or -- in this case -- worse than has been previously recognized); wave 4 then corrects a portion of wave 3, however it never crosses up into the territory of wave 1; and then wave 5 completes the move and the fractal. That series of five waves is called a "motive wave" and those waves together complete one wave of a still larger wave which may be either a motive (five wave) or corrective wave (three wave), and so on and so on (see diagram at right, which shows up if you click on that black rectangular void -- at least, that's what I see on my screen). So once wave-v down is complete, that will complete Minor (1) and we'll get a larger correction that is free to move all the way up to where wave Minor (1) began. Anyway, the traditional stair-step is one possible form for the current wave v.
The second possibility is that wave v will form what's called an "ending diagonal." In traditional technical analysis, this is often called a wedge. An ending diagonal does not follow the usual rules for wave creation: for example, in a diagonal, wave 4 is allowed to cross into the territory of wave 1, and often does. I don't want to get too in-depth here on when diagonals are appropriate in the formation and so forth, there's already books for that -- but suffice to say that this is a prime set-up for one to form. It especially fits very well with our Minor (1) target, which was arrived at based on the larger wave form. If the current wave v takes the more traditional waveform discussed previously, we are going to need to lower our target. I have illustrated the possibility of an ending diagonal with the gray count and lines. So those are the two preferred possibilities. By the way, since we're being edumacational, "preferred" means the view favored by that particular analyst. Elliott Wave is as much an art as a science, and there are often different interpretations and possibilities available. No analyst can be right 100% of the time, just as no head and shoulders breakdown is 100% guarantee. One of the things that makes Elliott Theory unusual is that it's not nearly as simple as most technical analysis. There's a great deal of information that must be parsed before a count is decided upon -- and since understanding the big picture is critical to understanding the present picture, good analysts often dig back decades, or even hundreds of years, to analyze the charts at different degrees of trend. This process can take days or even weeks, which is one reason you see so many very bad calls being made by dilettantes claiming to be under the Elliott umbrella. You can't just waltz in and start calling the market based on what happened yesterday, or last month, or even last year -- not until you understand where today, last month, and last year fit in with the last hundred years. so both of these counts go down to 1060, but the first one could go as high as 1185 first? And after 1060, is there a rally? And the ending diagonal is the end to what? The decline? The wave? Thanks for all your work and charts. I hope I will be able to comment. I think I have to find some account like the ones on your Select Profile list and then log into it. So I will try to do this. Have wanted to comment before but it seemed to complicated. Hi, thanks for commenting. The 1060 target was arrived at from the larger wave structure, and for the count that is *not* an ending diagonal to work, the 1060 target will need to be lowered. I'll try to address this in more detail in the weekend update. The ending diagonal would be the end to wave Minor (1) down, to be followed by a multi-month Minor (2) rally... which would then be followed by a steep decline in Minor (3) down. Hope that answers your questions!